« What’s the Real Difference Between Conservatives and Libertarians? I’m finally back in Washington after a week in Australia for the Mont Pelerin Society general meeting. Aussies are great people, but their government is just as misguided as the one we’re burdened with here in America. A friend took this pic of me on a visit to Manly Beach. You may notice a similarity to this other photo (though the Australian sign has not been changed to reflect truth-in-advertising). Moreover, it also appears that the Australian Tax Office is just as odious as our internal revenue service. One of the Aussies at the Mont Pelerin meeting told me that his nation’s tax police were going to investigate a bunch of people because…drum roll, please…they purchased hail-damaged cars at an auction. Yes, you read right. Being a frugal shopper and looking for bargains apparently is seen as behavior that cries out for harassment by the tax man. I expressed some skepticism when told this story, but the Aussie sent me a link to a story that ran in the West Australian. Here’s an excerpt. Tens of thousands of Perth residents who bought a new car after the March hailstorm face a new danger – a close examination of their tax details. The Australian Taxation Office revealed yesterday it was expanding its data matching program to take in cars worth more than $10,000 that were sold, transferred or newly registered between July 1 last year and June 30 this year. Tax commissioner Michael D’Ascenzo said…”In the past our motor vehicle data matches focused on luxury cars, but the net is now being cast much wider,” he said. “We’re looking to identify businesses that sell vehicles and fail to report or under-report those sales. “We’re also looking at whether a person’s income was not sufficient to support the purchase of the vehicle. …Car sales in Perth went through the roof after the March 22 storm when many hail-damaged vehicles were written off by insurance companies. WA car sales hit an all time high of almost 12,000 in April, a jump of 29 per cent on March, as drivers rushed to buy a replacement vehicle. Almost every one of those purchases will fall under the ATO’s watch. south thought Australia got through the GFC without even going into recession. 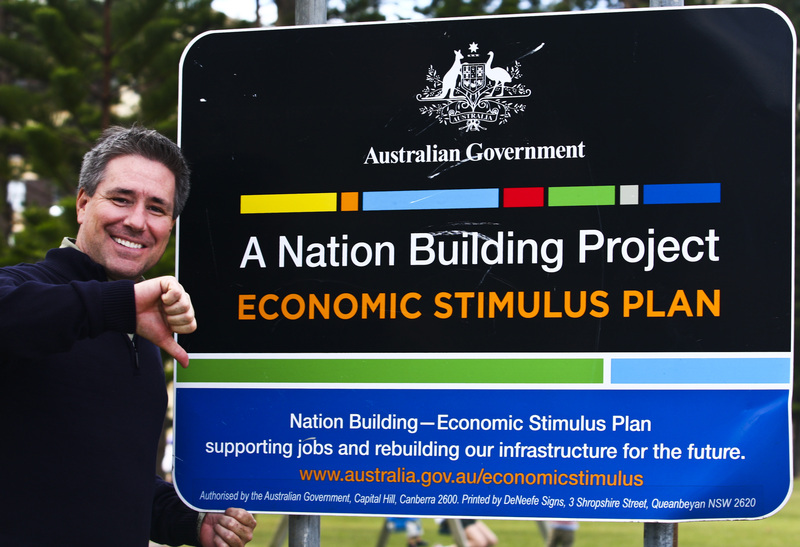 Why does it even need an “economic stimulus” (scam) …. The fascist Leftards in office (back then) – whose “party” (gang) is the wholly owned property of Australia’s mobbed-up labor unions (think “Mob!”) – Solyndra’d it off to coffers, cohorts, cronies and co-conspirators. Our Labor government decided to blow our existing savings retained by our last conservative government and spend it on building school halls that never got finished and programs that were poorly laid out. Its a damn shame most Aussies didn’t understand what ‘neo-Keynesian’ meant when they elected our PM. I thought Australia got through the GFC without even going into recession. Why do they even need an economic stimulus plan?